Join us in April, 2018 for our hands-on construction segments and small-group business development workshops. 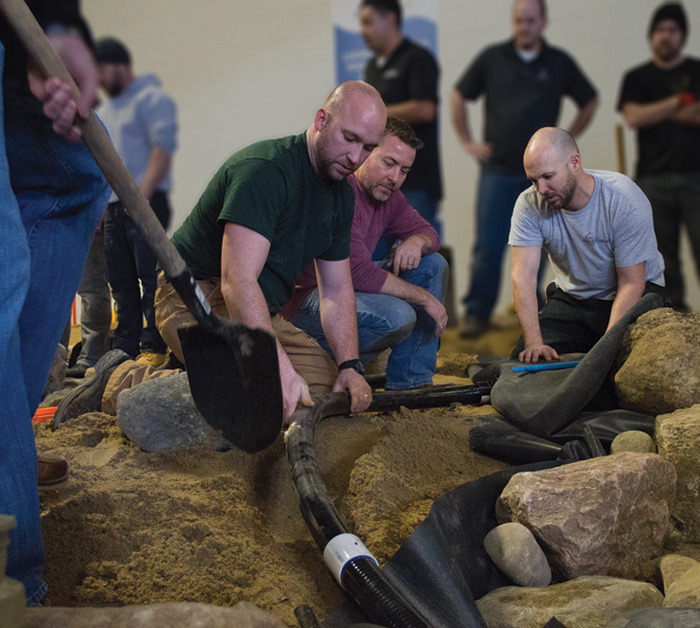 Classes are held at Aqualand, in a climate-controlled training facility and provide valuable, in-the-field experience for both new and experienced water feature installers. If you intend to participate in hands-on training and build water features in our indoor sandbox, please pack what you’d need for a day in the field, including work boots if you have them. If you plan to join us for a game of wally-ball, basketball, soccer, or wish to use our fitness center (which includes a cold plunge, hot tub, steam room, and sauna), please pack athletic wear, sneakers, and a swimsuit. If you want to maximize your time with Aquascape subject matter experts in the areas of marketing and accounting, please pack your laptop or iPad. If you’ve attended Aquascape Academy in the past and have an existing Operating Manual, please feel free to bring it along and build your library of resources.